Site specific dance and music performance in the cotton warehouse of the factory Engels in Engelskirchen, Rheinisches Industriemuseum. Dancer and violinist relate to the architechture and acoustics of the warehouse interacting to the 17th century composition of Franz Biber. The musical form of Passacaglia is a playful sequence of motifs, originally created for streetparades. The artists travel with their audience through the warehouse creating imagery in the different perspectives of the space. They employ supporting beams, railings, windows, doors, siderfooms and the open regions of the space to create visual imagery with the dancing body, while the sound of the violine resonates with the acoustic quality of the space. Starting with working on the space both artists develop with body and sound images resonating with the atmosphere of the location. 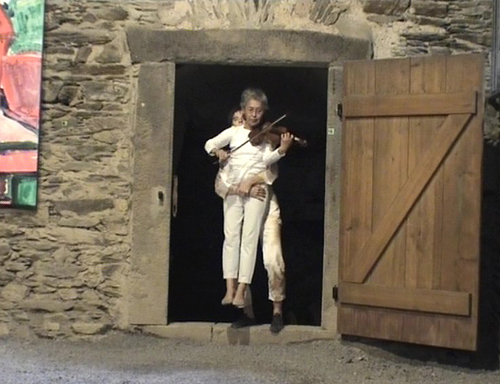 In each scene they show a different relationship between dancer and violinist: interacting as well on the musical as on the physical plane this originates expressive imagery. 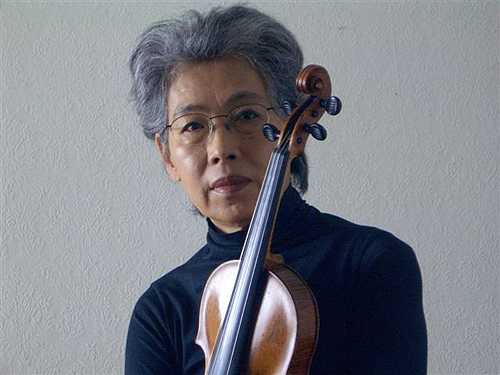 Takadas experience as a violinist in the WDR- Sinfonieorchester Cologne for more than 30 years provides with an enormous repertory of music while Lieberknecht is a mature performer creating with her body for 30 years as well. The audience is guided through the stations of the performance. Premiere has been in the Galery im Fronhof, Leutesdorf 2008, in a medieval building, programme Geysirsprünge III. Participating in Gregor Weber's multiperformative shows in the Kunsthaus Rhenania Köln Lieberknecht and Takada developed a sequence of twentytwo 8-minute free improvs. The improvisational series ( in any form) will be continued on request.